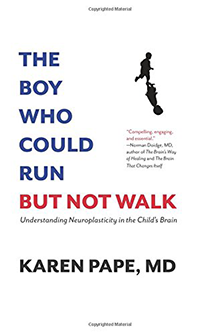 In this ground-breaking book, Dr. Karen Pape provides a compelling mix of the latest discoveries in brain science with a professional memoir of her decades-long personal struggle to help children whom the medical profession had largely written off as beyond help. As a neonatologist, Dr. Pape became interested in why some babies with brain damage recover fully while others develop cerebral palsy. Her exploration of recent advances in brain plasticity led her to successfully apply those principles in treating patients and to strongly advocate for the medical profession to pay attention to treatment advances typically denied to most families. A compelling personal and scientific journey makes for a good read, filled with outrage, hope and promise.